Ever wonder why colostrum is referred to as ‘liquid gold’? Produced starting usually in late pregnancy, colostrum is the first milk a baby receives. It’s thick, rich, and yellowish or even orange (thanks to the antioxidant B-carotene) as opposed to the comparatively thin, watery, white or blue-tinged features of mature milk. It’s comprised of at least sixty different elements, half of which are exclusive to human milk. Colostrum has the perfect balance of nutrition for the newborn human: it’s high in carbohydrates, protein, minerals, sodium, potassium, chloride and cholesterol (the last four presumably to help develop the baby’s brain, heart and nervous system). It’s low in fat, which is difficult for the virgin gut to digest. It’s the absolute perfect first food for every baby. 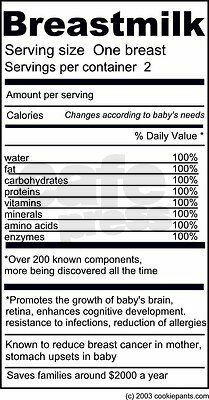 contains high amounts of sodium, potassium, chloride and cholesterol thought to encourage optimal development of your baby’s heart, brain and central nervous system. – See more at: http://www.breastfeedingonline.com/importanceofhumanmilk.html#sthash.xi2j6zUE.dpufIt the absolute perfect first food for every baby. When a baby is born, the intestinal tract is not fully developed. It is quite permeable, in fact, as holes are found in the lining throughout (this is a normal condition called ‘open gut’). Colostrum is designed to fill in open gut holes like a medicinal ‘grout’ and to keep foreign agents from passing through the holes into the bloodstream. This is one reason why underdeveloped, premature babies who are fed colostrum thrive better and are tube-fed for less time than those fed formula. Colostrum is specially equipped with properties called growth modulators, which help babies to acclimate to oral feeding (remember, all of their nutrition prior to birth came through the umbilical cord directly into the abdomen). Because a newborn’s stomach is very tiny and cannot hold more than a few drops of liquid at a time, colostrum is provided to a baby in small volume but high concentration of nutrients. The colostrum acts as a laxative to help a baby pass meconium (the first stool), important especially to clear the body of excess red blood cell waste that accumulated from birth. Colostrum continues to provide the same immunities a baby received from the placenta while in utero. It’s densely packed with living cells from the mother and also antibodies including secretory immunoglobulin (IgA), which protects the baby’s super-sensitive mucous membranes of his throat, lungs, and intestines. It’s like a super-charged probiotic, introducing a population of beneficial bacteria to the gut so the baby’s internal features will flourish. It’s chock-full of living white cells called leukocytes (which are found only in breast milk, including mature milk, and cannot be added to formula) that fight off viruses and destroy bad bacteria. Colostrum is also packed with lactoferrin, which kills E. Coli bacteria. Speaking of bacteria, one study by Spanish researchers found 700 different kinds of bacteria in colostrum (not 700 bacteria, 700 kinds) — and we’re talking about the really good kinds! Fibronectin, which is highly concentrated in colostrum, makes “certain phagocytes more aggressive so that they will ingest microbes even when the microbes have not been tagged by an antibody… [F]ibronectin minimizes inflammation; it also seems to aid in repairing tissue damaged by inflammation,” says Dr. Jack Newman. Colostrum is available in limited supply, so take advantage of this once-in-a-lifetime chance to strike liquid gold and nurse your newborn at least every two hours. Transitional milk starts filling the breasts at about two to four days after birth, then colostrum gradually turns entirely into established, mature milk by about two weeks post-birth. Transitional milk has high levels of fat, lactose, and water-soluble vitamins. It’s also more caloric than colostrum because by this time the baby’s body is (presumably) recovering from birth nicely and can focus on getting back to its birth weight. Mature milk is what your baby consumes for the rest of his nursing career once transitional milk has bid its final sayonara. It’s comprised of about 88% water (alas it’s unnecessary and potentially dangerous to give an exclusively breastfed baby additional water) and the rest is a perfect cocktail of protein, carbohydrates and fats (among hundreds of other things) for energy and growth. First things first: Hindmilk and foremilk are not two separate kinds of milk. Your breasts only make one kind of milk — breast milk. The milk at the start of a feeding doesn’t just go all Jekyll and Hyde halfway through a feeding and suddenly decide to let the fatty globules loose. Minerals, vitamins, fats and proteins are present in every drop of milk, not just foremilk or hindmilk. It’s actually a nice gentle transitioning of amounts from start to finish. However, the nutritional content of breast milk does change from the beginning of a feeding to the end, and it’s useful to understand how this works. Think of it this way: first, the baby’s thirst is satiated by a nice gush of refreshing foremilk. Then as the feeding progresses, he gets the richer, fattier hindmilk that supplies most of his calorie needs and makes his belly feel full. It’s a full-course dinner from soup to dessert, and your baby needs the whole shebang. Let’s take a quick tour of the travels of human milk through the breast. So, we can tell the process agrees with basic laws of gravity because the milk-producing cells (alveoli) hold back the fattier breast milk molecules that happen to be larger and heavier. They get ‘stuck’ there until later in the feed when the baby has better access to them with a more direct suckling compression. The less dense, more watery, and lighter milk floats to the top (tip, rather) of the breast before this fattier milk. Foremilk, the more watery milk ahead of the alveoli, is what you could call the ‘thirst quencher.’ This high-volume, lower-fat milk at the beginning of a feeding has more water, protein, lactose, and vitamins than hindmilk at the end of a feeding. It tends to be bluish in color. Lactose** is especially crucial for brain development and energy. Though foremilk is lower in fat than hindmilk, it’s not always low in fat itself. The amount of fat in foremilk depends on breastfeeding patterns, which vary between individual mothers at different times of day, how often she lets the baby nurse, and how long the baby sleeps uninterrupted by feeding. During a feeding, foremilk gradually takes on more characteristics of hindmilk by steadily increasing in fat (like I said before, breast milk doesn’t just flip a switch and instantly morph like something out of Dr. Jekyll and Mr. Hyde). The milk-ejection reflex (which spurs into action after a brief period of suckling stimulation) squeezes the ducts so the fattier portions of milk can move downward. Hindmilk looks creamier and has higher levels of fat — this is crucial for weight gain and, again, brain development in a normal baby (protein, incidentally, is not as crucial for brain growth, which is the focus of an infant’s physical development rather than overall body weight). Do keep in mind that it’s total daily milk intake that determines a baby’s overall weight gain, not just the amount of hindmilk. Despite what some health care providers might insist, there really is no magic number of minutes that a baby needs to nurse to be able to get the fattier hindmilk, and brief nursings don’t necessarily preclude the baby from feeding ‘long enough’ to get it, either. What you should know is that foremilk mixes with any milk leftover from the prior feeding. If it’s been too long between feedings, this milk will be quite diluted — one reason why frequent feedings are nutritionally ideal. If the baby nurses often (which is the biologically normal behavior) the leftover hindmilk mixes with the foremilk that will begin the next feeding and thus makes it more caloric. The less milk a woman has in her breasts, the fattier it is. There’s no need to be concerned about your proportions of hindmilk and foremilk unless you’re experiencing challenges caused by an imbalance. This is usually isn’t so much a true imbalance but actually a milk management issue. Interestingly, milk imbalance is not a common issue in places where frequent feedings are normal for infants. Imbalance occurs due a lack of understanding about how milk production and transfer works, not because of a problem with the milk or ducts themselves. Too much foremilk — which is often caused by oversupply or going too long between feedings (more than two or three hours) — can result in the baby receiving a lot of lactose and an inadequate amount of fat to balance it out. If you notice a green, frothy diaper on occasion, it’s just one more thing on the scale of ‘normal’ to come out of your baby’s bum and nothing to worry about. But, if you suspect you have a problematic oversupply due to constant frothy green diaper output and/or your baby has clear, regular symptoms of malabsorption or consistent failure to gain weight, then you must look into troubleshooting milk imbalance. Thankfully, balancing out your feeds has an easy fix! Again, it’s the total amount of milk consumed that determines how much fat a baby receives overall, so if you cannot feed more frequently and you have an imbalance, you can try block feeding. Read about the possible signs of oversupply (and baby receiving too much foremilk) and solutions here.